We supply graphic overlays (fascias) that are cost effective, durable and functional. They are used to bring attention to your product and its features, facilitating functionality. Three critical aspects of any Graphic Overlay are Form, Fit and Function. Our Art Department Staff can aid you in the design of your graphics. Our Graphic Overlays provide a colourful first impression and make instructions clear for your end user which results in a product that you and your customers will be proud of. We work with you to determine the most suitable material and thickness to suit your applications. Polyester and polycarbonate are the most commonly used substrates. We also offer unique substrates with UV inhibitors for harsh exterior conditions. 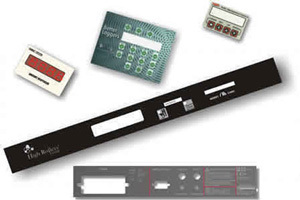 Specialised adhesive backings can be applied to adhere to a wide variety of substrates in various conditions. i.e. Exterior use, Polypropylene, powder coating etc. 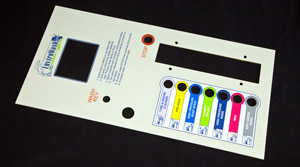 Graphic overlays are used in all types of applications including electronic equipment, appliances, telecommunications equipment, fitness equipment, medical equipment, security, vending machines and a wide variety of other products. 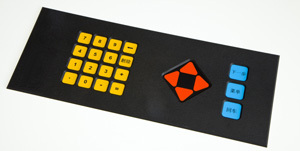 They are ideal for use with tactile switches where a membrane feel is required.